The Fellowes Electron 180 paper trimmer is a brand new rotary trimmer from Fellowes that features an LED guide that clearly indicates the cutting line and offers SafeCut cartridges for improved safety. This cutter offers an eighteen inch cutting length and can cut up to 10 sheets of 20lb paper at a time. It comes with four SafeCut cartridge blades for straight cutting, wavy cutting, perforating and for scoring. The durable metal base of the unit has integrated SafeCut blade storage compartments so the blades won't get lost when they are not in use. The Fellowes Electron 180 also includes a variable paper clamp to ensure cutting precision and a quick change blade system that allows you to quickly and easily change cutting styles. The Fellowes Electron line of cutters are the only models that include an LED cutting guide and unlike some other rotary trimmers with guides, this unit does not use potentially harmful lasers. 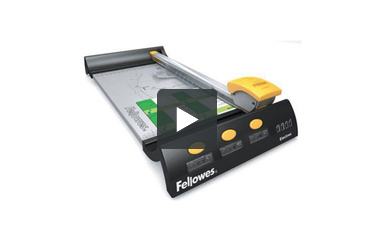 Discover today what the Fellowes Electron 180 rotary paper trimmer can do for you. Item H x W x D: 3.375" x 8.625" x 24.625"
Best Purchase Ever. Have done enough comparison among various products in the market and concluded that this is the one I am buying. It is easy to use with all the cutting patterns I am looking for, blades are sharp and so easy to change, platform is strong and stable, mostly the helpful feature of the led guide is so unique that others do not have. So far, I have not seen any problems on this machine and with the price you paid definitely worth of the money. I strong recommend this product to everybody. The versatility and ease of use is wonderful! It comes with four blades, strait cut, wave cut, fold, and perforation! The safety blades are great no boo-boos! I spent a good part of the morning experimenting and the results were awesome! The 18” cutting length makes it easy to trim larger documents, the lighted cutting guide made it easy to see where the blade was. Overall this product is just what we needed! Welcome to MyBinding video. This is a look at Electron 180, an 18 inch rotary paper trimmer. For both the home and the office, the Electron 180 is a slick, stylish, and clever little trimmer. The blade is sharp and precise and can handle laminate materials, cardstock, and up to 10 sheets of 20 pound paper. The finger guard and also paper holder is adjustable up and down the length of the blade. This allows you to place your project anywhere you'd like and in any configuration. And with the full 18 inches work surface, large projects, posters, oversize, and double projects are all easily done. Fellowes is designed in the safe cut cartridge is quite clever. Changing the blade in and out is very simple and there's no way to cut yourself because the entire blade is capsulated inside the cartridge. With the Electron line, you get the built in red guide light. Power switch is just under the handle and then activated by pressing the handle down. This is very helpful in projects that require non-standard angles and lines. On the front of Electron 180 are three sockets. These hold additional blade cartridges. They could be replacement straight edge blades or any of the variety of project blades produced by Fellowes such as the perforated blade, the wave blade, or the scoring blade which makes creasing easy, all of them easily exchanged in seconds. That's the Fellowes Electron 180. For more demos, reviews, and how-to's, check out MyBinding.com. A rotary trimmer is a must-have device if you want a way of making perfectly straight cuts. One trimmer that can help you out is the Fellowes Electron 180. Here's some information about it, including how it rates on a scale of 1 to 10. The Electron 180 is great to use if you need to trim larger documents. It can cut paper that's up to 18 inches long, so you'll be able to trim legal-sized documents that are 8.5" x 14". You'll even be able to work with tabloid-sized paper that measures 11" x 17". This device can cut a maximum of 10 sheets of 20 lb. bond paper at once. This isn't a whole lot, so you'll want to choose a different cutting tool if you need to cut a lot of paper at one time. The Electron 180 is really safe to use. It uses a special SafeCut cartridge. What this does is keep your fingers from coming into contact with the blade so you won't be injured. You'll be able to cut a lot of paper and will be safe the entire time. There are four different blades you can use with this device. You can choose from scoring, perforating, and wavy blades as well as the ever-popular straight ones. Since there are different blades available, this would be a great trimmer to use when crafting (i.e. making greeting cards, scrapbooking, etc.). The blades are really easy to change as well. Getting an accurate cut is pretty easy with this trimmer. The paper clamp can be moved around as needed and there's also an LED guide that will show you where the cutting line is located. This device doesn't have any lasers so that makes it very safe to use. This trimmer has a very durable base that's made out of pure metal. The base has a storage compartment for your extra SafeCut blades so they'll always be within reach. The Electron 180 is on the large side, so you'll need to have a fair amount of space free. This product has dimensions of approximately 3" (height) x 9" (width) x 25" (depth). But while this trimmer is big, it doesn't weigh very much. In fact, it weighs a mere 5 pounds. Fellowes is known for giving their products generous warranties and that's certainly the case with this device. It's covered for 2 years. Plus, the Electron 180 is affordably priced and will cost you less than $100.00. Rating: 8. If you've been looking for a rotary paper trimmer, the Fellowes Electron 180 would be a pretty wise choice so long as you're comfortable with its cutting capacity. Ten sheets isn't really that many, so this is a trimmer that is best for small jobs. It just can't cut the same amount of paper as a guillotine cutter. But, cutting capacity aside, this trimmer is worth a look. It's great that it can use different types of blades and that it has an LED cutting line. And, of course, it's affordable and comes with an excellent warranty. So if this is what you want in a rotary trimmer, the Electron 180 might be a great fit.